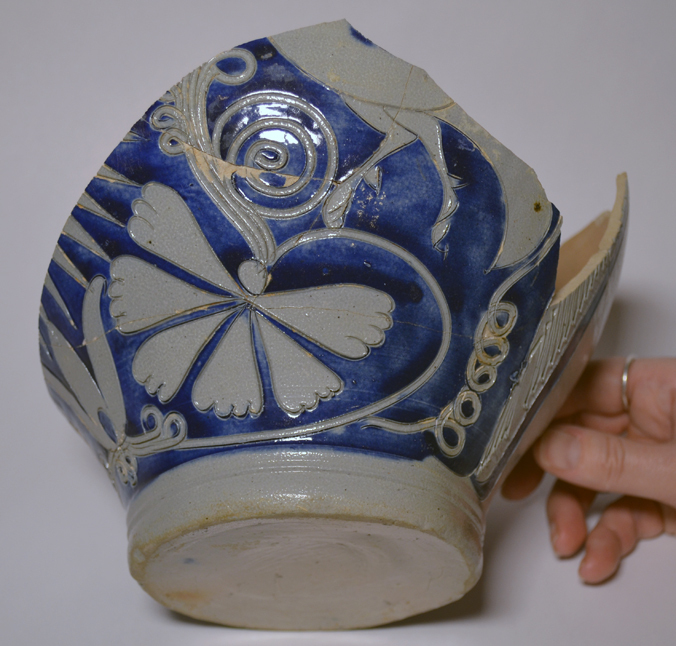 At George Washington’s Ferry Farm we’ve just wrapped up a ceramic mending project. We explain how and why we undertake these mending projects in this post. Our most recent effort focused on Westerwald stonewares owned by the Washington family. Stoneware is a high-fired, non-porous ceramic that is excellent for producing storage containers and drinking vessels. But what is a Westerwald, you may ask? Well, Westerwald stonewares were a ceramic produced in the Westerwald region of what is now Germany beginning in the 1500s. Destined for the British Isles and British colonial markets, this particular ceramic is common to archaeological sites in the Chesapeake region. Westerwalds were salt-glazed, meaning that during the firing process large quantities of salt were introduced into the kiln. The salt vitrified (converted into a glass-like substance) upon contact with the vessels, producing a shiny glaze and a characteristic ‘orange peel’ texture on the surface of the pots. Decorated predominantly with molded and incised designs that are filled with bright cobalt blue and deep purple, Westerwalds are strikingly beautiful. Jug with a bird motif. We’ve learned a great deal from analyzing the Westerwalds used by the Washingtons. Many of the vessels identified in the Ferry Farm assemblage were tankards, jugs, and other drinking vessels from which beverages such as ale and cider, a large part of the colonial diet, were consumed. Some tankard handles we’ve excavated have small holes at the top, where a pewter lid — a distinguishing characteristic of German-made steins — was attached. These lids often do not survive in the archaeological record because the metal had value. Rather than being discarded, the pewter was often recycled. In addition to being aesthetically pleasing, Westerwald drinking vessels often served a political purpose. An excellent example of this is to be found within our assemblage of Westerwalds in the form of multiple mugs emblazoned with the initials ‘G.R.’, meaning Georgius Rex, the Latin for King George. During the time Westerwalds were produced in Germany, three British kings were named George. Interestingly, however, all three came from the House of Hanover, a German royal family placed on the British throne in 1714. For Americans, of course, the most famous of these Hanover kings was George III. Sprig decorated G.R. medallion on a jug fragment. Thus, a gentleman sporting a ‘G.R.’ on his tankard or jug advertised his loyalty to the Crown with every draught of ale. A night of drinking involved numerous toasts “To the King’s Health!” It was not unheard of for dozens of toasts to be recited for the king, his family, and anyone else of political interest the imbibers saw fit to honor. Toasts and drinking vessels were also utilized to express disagreement with political powers. Politics and drinking definitely went hand-in-hand in the colonies. Once George Washington became a public figure, there were toasts such as “To General Washington, and victory to the American arms!” to honor him. The presence of these initialed Westerwalds at Ferry Farm show that until the Revolution the Washington family, like most Americans, viewed themselves as loyal subjects of the British Crown. Indeed, many families in Fredericksburg would have owned such mugs and toasted their monarch prior to the war. In fact, several ‘G.R.’ vessels have also been excavated at Historic Kenmore, the home of George Washington’s sister, Betty. The people of Ferry Farm, Kenmore, and Fredericksburg found their daily lives governed by Britain’s global economy and imperial culture. Colonial men – whether gentry, tradesman, or servants – pursued homes, professions, pleasures, and possessions that conveyed their status, wealth, and English identities. One such possession that emphasized this identity was Westerwald drinking vessels. Hollowware fragments with an unknown motif. One has to wonder what became of these mugs once the Revolution began. 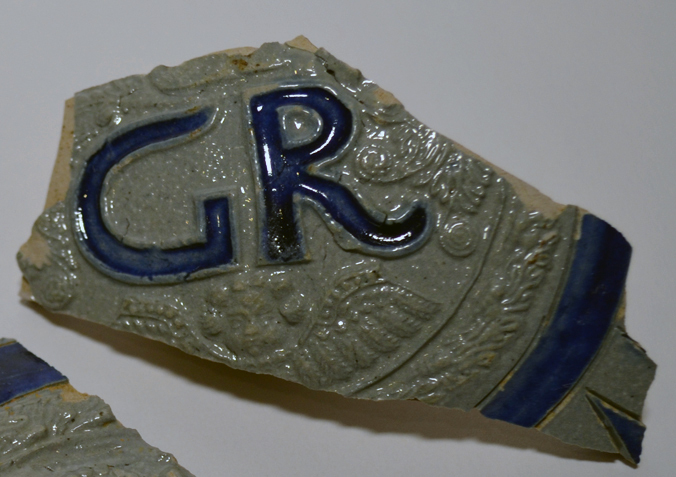 Did Loyalists quietly stash away some of their ‘G.R.’ mugs once the tide of war went against them? Perhaps some tankards and jugs were smashed publically by Patriots in a ritual different from their intended purpose of toasting but no less a political act than those toasts had been. Nevertheless, it is intriguing to picture a young George Washington drinking heartily from a ‘G.R.’ mug and toasting a king against whom he would lead a revolution.